As my venture into the world of foundations continues, so does my quest to find great primers! A good makeup primer can make such a difference in the look, feel, and wear of your foundation or powder. Primer smooth out the surface of your skin for a flawless look. Have you heard of Reviva Labs? If you frequent your local Whole Foods or other natural foods store, then you likely have. Reviva Labs is a natural beauty brand found not only in health food stores, but also professional skin clinics & spas (and of course online too at Revivalabs.com). Interesting fact: Reviva Labs' founder was the first to ever introduce "exfoliation" to the American Health food industry & Skincare industry back in 1973 with their "Light Skin Peel" (which is still available today, and I am in fact dying to try!). Today, Reviva Labs continues to strive for high-potency and effective skincare treatment products that are available at a reasonable price. The products are made with natural ingredients and are cruelty-free, which is always a big plus in my book! 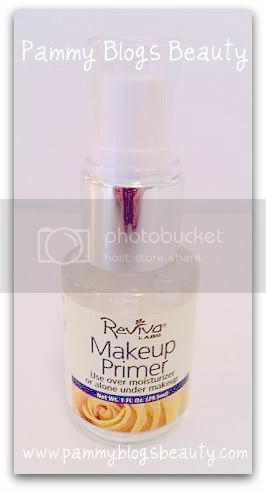 For my review on the Reviva Lab's Makeup Primer, keep reading after the jump! This is a clear, non-comedogenic silicone-based primer. It has a wonderful gel-like consistency. It adheres very well to the skin. 1 fl oz retails for approximately $19.50 at Whole Foods or online. This primer is completely fragrance free and I *love that*!!! So, what do I love about this primer? This primer makes my skin feel so silky smooth! It just feels amazing going on my skin. Seriously, I would love to bathe in this stuff! I really like that it comes with a pump. Ya'll know me, I have a thing for pumps. One small pump of this dispenses just the right amount for your face. The cap seals well and you have no leakage or waste. Both liquid and powder foundations glide on beautifully over this product. My skin really looks flawless with this on. Who doesn't love that! This primer helps to diffuse the look of your pores and also it can help disguise any fine lines. Granted, I don't really have any fine lines, but when my skin is super dry/dehydrated some can crop up in the eye area. I have dry skin, so I typically have no trouble having my foundation last all day. But, with that said, my foundation wears all day with no issues on top of this primer. My dry skin feels incredibly comfortable with this primer on. I feel that it helps my skin maintain its moisture. What I really love (versus other primers on the market): This product has "good-for-your-skin" ingredients, so you are not getting not only a great makeup primer but also some skin benefits because it contains Vit A, Vit D3, and Coenzyme Q10 (a protective antioxidant). I figure, if you are going to use a primer anyway, you might as well use one that is going to be somewhat beneficial for your skin. In summary, I totally enjoy using this Reviva Labs Makeup Primer! I love the look and the feel as well as the good ingredients! I will continue to use this primer for the flawless makeup application that I get while wearing this and for the skin-benefits! Hey Priscilla! :) I am pretty new to primers too. I have dry skin, so primers for me are more about diffusing the look of pores (mine are rather large). This primer really gives a smooth and even surface so my foundation applies better. I betcha this primer would help your foundation to last longer! :) XOXO my friend!!!! Hey Pammy! I'm planning to post my review of this product this week, but it doesn't seem to do anything on my face except as an eyeshadow primer. @Gaby-Oh, how funny! I look forward to reading your review this week. Sorry it didn't work out for you! @sugar sugar-Hey there! Agreed! :) xoxo!! !